This guide walks you through setting up pricing in MyClient. 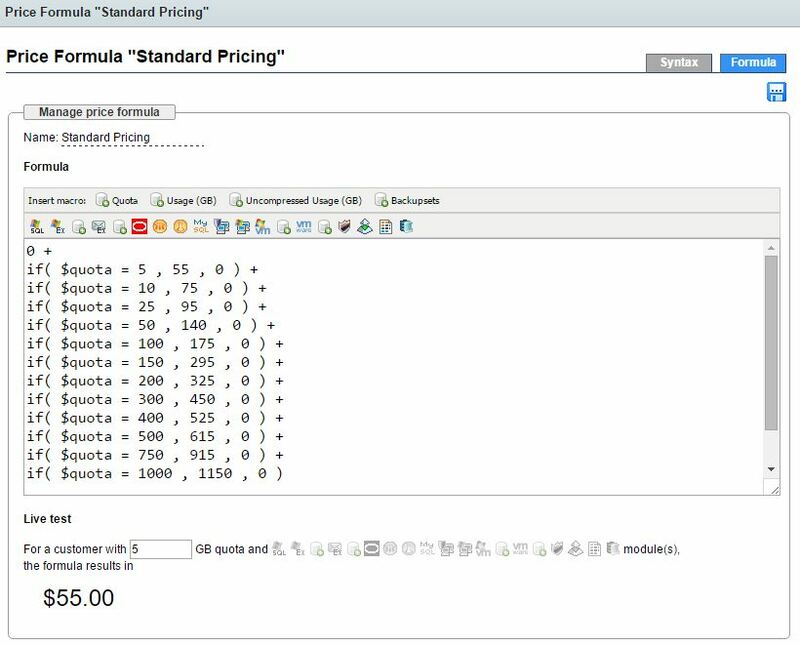 MyClient allows you to create your own custom price formulas for your customers and resellers. These price formulas can also be used in conjunction with our sign up form to create a seamless experience for new customers. Our dynamic pricing system once configured allows your customers' balance to move up and down as their usage does, or any other situation that you define. From this area you can create any number of account plans for your customers and resellers. To get started select 'Add new plan' then enter your description for the plan. The following screen will allow you to configure your plan settings, we suggest taking some time to work through each area. The Price Formula tab allows you to configure the charges for the plan. From each drop-down you can choose your price formula or associated charge that you have created in the Price Formulas area. 'Remain fixed at creation time' - This option will cause the price to be calculated once, at creation time, and remain fixed thereafter. 'Auto update from the formulas above (copied/linked)' - With these options, the formulas configured for the plan will be linked or copied to the new account. This means that if the plan is later updated to use different formulas, these new formulas will not be applied to the account. i.e pricing is tied to the formula that was in use at the time of account creation. In the case of the 'linked' option, any changes made to the formula (via the price formulas editor) will be applied to the account. In the case of the 'copied' option, the formula will be copied to the account at the time of creation, meaning later changes to that formula (via the price formulas editor) will NOT be applied to the account, and instead any pricing formula change for that account will have to be made directly in the billing configuration for that account. 'Auto update from the formulas in this plan' - With this option, the current formulas configured for this plan will be applied at all times. This means that if different formulas are selected for this plan, these new formulas will be applied, and if the formulas attached to this plan are altered (via the price formulas editor), the altered formulas will be applied. i.e pricing is tied to the plan. Permission groups define the level of functionality that customers and resellers can access in the portal. Choose or create the permission group you wish to attach your account plan to, under 'New Accounts' select your desired plans to attach them. To apply these price plans to an already-created OBM/ACB account, open the customer's detail dialog and switch to "Billing" tab, then in the "Services" section change the desired billing categories select your desired price plan in the dropdown. Clicking the save will apply changes and recalculate price values.